A deck of Tarot Cards consist of a Fool, 21 Trump Cards and many others. When most people think of Tarot they think of divination, of gypsy fortune tellers reading the fates in the lay of the cards. It may come as a surprise to many that in a number of countries the deck of Tarot are used to play simple card games and it is thought that this was the deck’s original purpose. The first deck of Tarot cards are thought to have emerged around 1410 in either France or Italy, but the first documented case of the cards being used for divination purposes wasn’t until the early days of the 18th century. Whether or not they were used as fate readers prior to this is unknown. 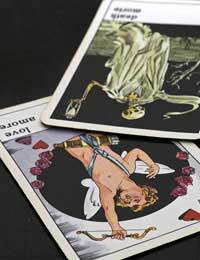 The modern Tarot deck consists of 78 cards and is broken into two distinct groupings. The Major Aracana (or Greater Secrets) hold the trump cards, 23 cards with no suits. They are The Fool, The Magician, The High Priestess. The Empress, The Emperor, The Hierophant, The Lovers, The Chariot, Strength, The Hermit, Wheel of Fortune, Justice, The Hanged Man, Death, Temperance, The Devil, The Tower, The Star, The Moon, The Sun, Judgement and The World. The Minor Arcana (Lesser Secrets) consists of 56 cards in four suits. Each suit holds 14 cards, numbered one to ten plus four court cards; Page, Knight, King, Queen. The suits are Coins, Wands, Swords and Cups. In order to divine with the cards, the owner of the deck has to lay them out in a certain pattern, called a “spread.” The most common spread is called the Celtic Cross, with four cards to one side and five in a cross formation, with the tenth card laid across the centre card, often representing the obstacle the person whose fate is being read must face. The three card spread is a simple idea. Only three cards are used, one representing the past, one the present and one the future. A more complex spread is the zodiac spread, with 12 cards placed in a circle, sometimes with a thirteenth in the centre of the circle. For those looking for the simplest spread of all, consider the one card spread. For the one card spread the owner of the deck must be able to divine an awful lot of information from a single card in comparison to the zodiac or Celtic Cross spread. Whatever the spread, the cards themselves must be interpreted and there are reams and volumes on the subject of exactly how to do so—and each method has its detractors as well as its supporters. Some common interpretations associate the suits with the four elements - Swords with air, Wands with fire, Cups with water and Coins with earth. The number of the card may be literal or be interpreted by numerology. As for the major arcane, each card is a complex history and possible meaning, often hotly contested. The Tarot started out as a game and became a tool for the purpose of divination. There is a rich history behind the deck no matter to what use it is put. Each deck is unique in at least the design, if not the specific cards and an interest in Tarot will require a commitment to learning more.